This week, we kicked it off by scaling new heights and making new best friends in the HTC Vive game Climbey on Monday. Tuesday, Will Mason whacked the hell out of a politically charged piñata, and Friday was an interview gone awry by a series of entertaining interruptions by children in Rec Room. Agile Rock Climber Az Balabanian and Legendary Parkour Artist Stuart Mason play the latest in HTC Vive multiplayer: Climbey. Making an appearance via avatar is Youtuber Tribal Instincts to join in an intellectual discussion about game breaking glitches and share the most interpersonal details of their work lives. To help motivate viewers to run to the voting booths, Will Mason does his best impression of Donald Trump to give viewers a peek into what Donald likes to do in his Dressing Room in Trump Simulator VR. He gives us a PSA on how to behave at Voting booths in Whack a Vote: Hammering the Polls. He also show us his batting abilities in the Pinata fighting simulator: TrumPinata. Quite a week, quite the show! Friday – Rec Room: Talk Shows in VR! Resident Heckler Joe Durbin meets with Rec Room developer Cameron Brown to talk about what the future of interacting with strangers online, throw some balls around, and play charades. Joe gets VERY into playing Racket Ball, Dodge Ball, Paint Ball, and makes a new best friend! 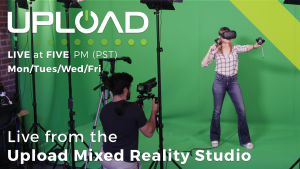 Riding on this week’s latest hype-train, the wonderful members and companies at the Upload Collective shot a VR #mannequinchallenge in the Mixed Reality Studio! Tuesday @ 5 PM PST – Tilt Brush: Techniques 3 Steve Teeple. Join in live to watch Steve Teeple, one of the Vive-weilding musketeer artists that painted the Dr. Strange’s piece in Tilt Brush. Watch the previous episode with Danny Bittman to get caught up! Want to us to feature your game on our live shows? Send us a build of your game to test it in Mixed Reality! Pre-requirements: HTC Vive / Unity. As always, follow UploadVR on Facebook and Twitter to get notified when we go live and jump in the discussion!